Defined in Article III of the United States Constitution as a branch of government separate from and co-equal to the President and Congress, the main U.S. judicial system is made up of a primary pyramid of courts, from the first-level United States District Courts, to the United States Courts of Appeals, to the Supreme Court of the United States. There are also specialized United States Bankruptcy Courts and courts established under Congressional rather than Constitutional authority, such as the United States Court of Military Appeals, United States Tax Court, and United States Court of Veterans' Appeals. In addition, there is a system of administrative law bodies in various regulatory agencies, presided over by administrative law judges who are usually civil servants. Decisions of these bodies usually may be appealed to the regular courts, beginning at the Circuit Court level. Military justice has a system of its own, using courts-martial at the lowest level; these can be appealed into the court system. Such appeals begin at the United States Court of Military Appeals. Judges (or justices in the case of the Supreme Court) are nominated by the President and confirmed by the U.S. Senate, under the concept of checks and balances. The traditional language is that the President appoints with the "advice and consent" of the Senate. Under the judicial system are persons and organization that exert supervision over arrest and surveillance. U.S. Magistrates determine if a prisoner may be held in the absence of an indictment from a grand jury. The Foreign Intelligence Surveillance Court acts in secret, and authorizes warrants for electronic surveillance and other inherently clandestine operations. Magistrates and District Court judges authorize warrants in non-national security cases. There are 94 District Courts, created on the basis of population, so a district might be small and significant, as with the Southern District of Manhattan, or cover a large but sparsely populated or territory. Bankruptcy courts are geographic but separate from the district courts. In addition, there are two first-level courts with national jurisdiction: The Court of International Trade and the United States Court of Federal Claims. 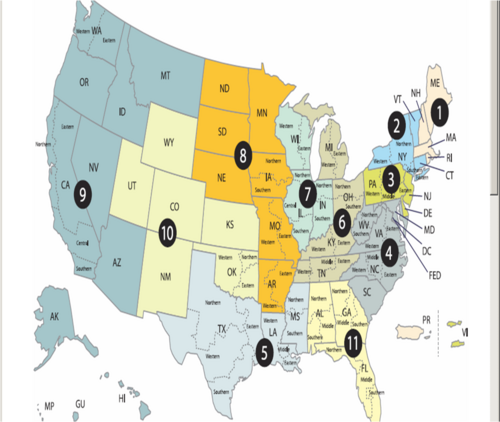 At the next level are 11 multistate Circuits, and the United States Court of Appeals for the District of Columbia Circuit. The latter is also known as the Federal Circuit, which has has nationwide jurisdiction to hear appeals in specialized cases, such as those involving patent laws and cases decided by the Court of International Trade and the Court of Federal Claims. The Court of Military Appeals is also at the second level. This page was last modified 16:28, 21 December 2009.